Uses: Cafeteria, Classroom Partitions, Construction/Maintenance Projects, Elementary School, Schools Lengths: 11 panel 20'-5", 13 panel 24'-1" Heights: 6'-0"
Students, parents, and staff had to wait years before the money was appropriated to complete the construction project earmarked for their school. After inclement weather and rising construction costs delayed the completion of construction, the school found themselves with the start of the new year upon them, but no new classrooms. The school administration worked quickly to procure Screenflex Room Dividers to divide their cafeteria into multiple classrooms. The plan worked great! Not only did the students start school on time, but they had fully functioning and comfortable classrooms in the cafeteria. The teachers and students were sad to leave this space when the construction was complete but was excited to use the room dividers throughout the school. For instance, the art teacher hung student artwork to display in the hallways during the open house. 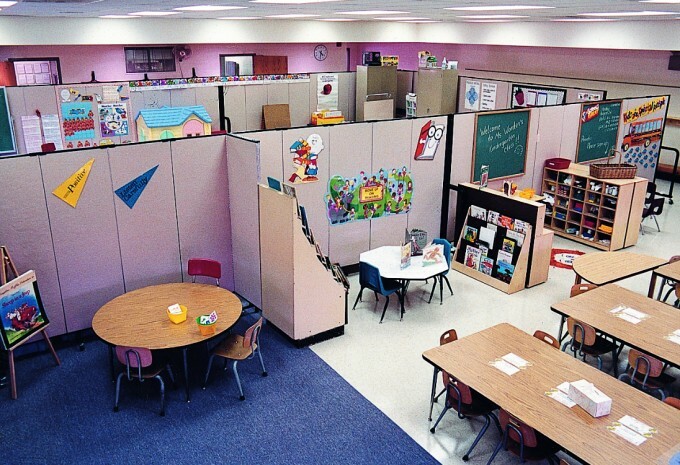 The school continues to use their room dividers in innovative ways throughout the school year.